Well, the baseball postseason is down to the final four teams. The division round of the playoffs included a lot more offense than any of us expected, but there was no shortage of drama, at least in three of the four series, not to mention the wild-card games. Of course, picking a winner from the four teams remaining isn’t much easier than if you were to pick one out of the 10 teams that reached the playoffs. All four teams showed signs of being a championship team during the division round and should be seen as legitimate threats to advance even further. Let’s check out of the betting odds for each of the four remaining teams winning this year’s World Series. The Indians being knocked out made the Dodgers clear favorites to win the World Series. In fact, it bumped up the odds of Los Angeles winning considerably. Of course, it didn’t hurt that the Dodgers made quick work of a Diamondbacks team that looked quite scary at the start of the series. Throughout the NLDS, the Dodgers showcased incredibly lineup depth, as the hitters at the bottom of the order did more damage than the heart of the order. That just gives the Dodgers one more way to win games that not every team can match. The Astros also benefited from the Indians losing, as they now have home-field advantage in the ALCS. Of course, that’s the least of what the Astros have going for them. It starts with Justin Verlander and Dallas Keuchel at the top of the rotation. In seven games, Houston should get at least four starts out of those two aces. The Astros also showcased a deep and powerful lineup during the ALDS. Houston hit eight home runs in four games against the Red Sox, and you could argue that they can be even better than that. To be fair, the bullpen was shaky at times, and A.J. Hinch didn’t trust his third and fourth starters. But two aces and a powerful lineup can take you a long way. The Yankees have won four games in the playoffs, all while facing elimination. New York’s lineup hasn’t exactly been an unstoppable force, but the Yankees are coming up with big hits in clutch situations. They also survived their series with the Indians without getting much from Aaron Judge. If he’s able to heat up in the ALCS, New York’s lineup will take on a whole new look. Pitching wise, the bullpen has looked good outside of a couple (major) hiccups, while the rotation got better the deeper they got into the ALDS. If Masahiro Tanaka and Luis Severino can pitch against the Astros the way they did against the Indians, New York’s rotation may be good enough to lead them to a World Series title. 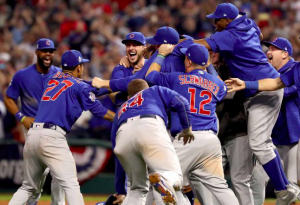 The Cubs are the embodiment of “survive and advance” after their series with the Nationals. Offensively, the Cubs didn’t get much going until Game 5 of the NLDS, hitting just two home runs in five games. However, Chicago’s lineup is capable of getting hot at any time. The Cubs also have the depth to play the matchups and stick with someone if they start to heat up. More importantly, Chicago’s starters only gave up six earned runs in 31 innings of work against the Nationals. The bullpen is another question, but the Cubs clearly have enough starting pitching to win another World Series.